Benjamin Rush, eminent Physician, writer, educator,humanitarian, is as interesting a figure as one could find in the formation ofthe United States. A wildly popular and much loved man, he was nonetheless afallible character. He was born in December of 1745 in Byberry, Pennsylvania,some twelve miles from Philadelphia. His father died when Benjamin was six, andhis mother placed him in the care of his maternal uncle Dr. Finley who becamehis teacher and advisor for many years. In 1759 he attended the College ofPhiladelphia, where he ultimately attained a Bachelor of Arts degree. Hecontinued his education with a Dr. Redman of Philadelphia for four years andthen crossed the Atlantic to attend to an M.D. at Edinburgh. He spent severalyears in Europe studying and practicing Medicine, French, Italian, Spanish, andscience. He returned in 1769, opened a private practice in Philadelphia, andwas appointed Professor of Chemistry at the College of Philadelphia. BENJAMIN RUSH was bornDecember 24, 1745 in Byberry Township near Philadelphia. When Benjamin was sixyears old his father died and his mother and stepfather raised him. Hisearliest instructor was his uncle, Reverend Samuel Finley, who subsequentlybecame the president of the College of New Jersey (Princeton) and preparedyoung Benjamin for that He graduated in 1760, with plans ok being a lawyer.However, he changed his mind and began to study medicine in Philadelphia andcompleted it in Edinburgh and London. He attended medical lectures in Englandand in Paris, where he enjoyed the friendship of Benjamin Franklin, whoadvanced money to pay Rush's expenses. In August 1769, Rush returned toAmerica, settled in Philadelphia and became the most famous American physicianand medical teacher of his generation. Rush, Benjamin 1760 (1746-1813) was a physician, teacher, andman of affairs who played a dramatic role in the early history of his country,his college, and his profession. A man of contradictions, he practiced andtaught the backward medical art of bloodletting, yet was far ahead of his timein the care of the mentally ill. He was a vigorous foe of slavery and capitalpunishment, an advocate of better education for women and of free publicschools. More than any other person he was responsible for bringing JohnWitherspoon to America as Princeton's sixth president. 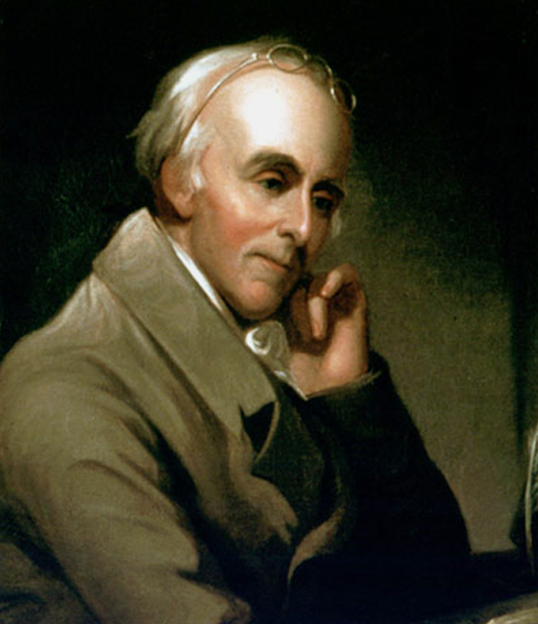 Benjamin Rush was born to John and Susanna HarveyRush on December 24, 1745. The family, which included seven children,lived on a plantation in Byberry, near Philadelphia. When Benjamin was five hisfather died, leaving his mother to care for the large family. At age eightthe young boy was sent to live with an aunt and uncle so as to receive a propereducation; he went on to study at the University of New Jersey (now Princeton)and received his bachelor's degree from that institution in 1760. Uponreturning to Philadelphia, Rush studied medicine under Dr. John Redman from1761 until 1766, at which time he departed for Scotland to finish his studies atthe University of Edinburgh. Receiving his medical degree in June 1768,Rush traveled on to London to further his training at St. Thomas's Hospital; itwas in London that Rush first encountered Benjamin Franklin. Benjamin Rush was born on the 24th of December, 1745, O. S.in the township of Byberry, twelve or fourteen miles northeast of Philadelphia.His ancestors emigrated front England to Pennsylvania, about the year 1683. Thefather of young Rush died when he was six years of age. The care of hiseducation therefore devolved upon his mother, who well understood theimportance of knowledge, and early took measures to give her son a liberaleducation. Young Rush was sent to the academy at Nottingham, in Maryland, aboutsixty miles southeast from Philadelphia. This academy had long been conducted,with great reputation, by the Reverend Dr. Finley, afterwards president ofPrinceton College, in New Jersey. Benjamin Rush was born on January 4, 1746 in ByberryTownship, Pennsylvania, the son of John Rush, a farmer and gunsmith, and Susanna Hall Harvey. After his father's death in 1751, his mother moved toPhiladelphia, where she ran a grocery store to support the family. At the ageof eight, Rush was sent to live with his uncle, Rev. Dr. Samuel Finley. Finley,a pastor and headmaster of Nottingham Academy, saw to it that Rush received aneducation. Rush entered the College of New Jersey (now Princeton) in 1759,receiving an A.B. in 1760, at the age of fourteen. Born in Byberry Township, Pennsylvania on December 24, 1745,Dr. Benjamin Rush taught chemistry and medicine at the College of Philadelphiaand wrote the first American textbook on chemistry. Also notable for hispolitical involvement, he was one of the signers of the Declaration ofIndependence for Pennsylvania. Furthermore, he established the first freedispensary in the United States, helped to found Dickinson College, served aspresident of the Pennsylvania Society for the Abolition of Slavery, and leftthe only account of the yellow fever epidemic of 1793 before passing away inPhiladelphia, Pennsylvania on April 19, 1813.